Steiff Bingo Monkey Comforter is hand made in the finest light brown and cream cuddly soft plush. 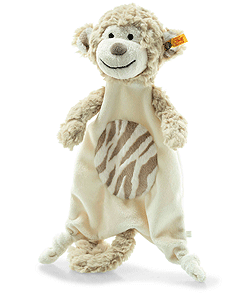 Soft Cuddly Friends Bingo monkey comforter measures 25 cm and is light-brown/cream-coloured. His body and face are cream-coloured. His nose is brown and his mouth and eyes are embroidered in black. He has white/cream stripes on his tummy and on the inside of his little ears, which stick out, giving him a silly look. The Soft Cuddly Friends Bingo monkey comforter promotes visual and haptic stimulation.